Compliant to ARM AMBA 3 ATB (ATB v1.0) and AMBA 4 ATB (ATB v1.1) Protocol. Support AMBA ATB Master, ATB Slave and ATB Checker. Support for multiple masters and slaves. 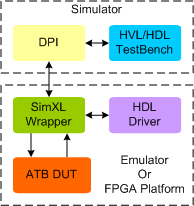 Supports all ARM AMBA ATB 1.0/1.1 data, byte and ID widths. Supports Flow control - valid/ready signaling for trace data. Supports different types of Flush Request control - Flush valid/ready signaling with trace data. Supports capturing of valid trace data. Flexibility to send completely configured data. Programmable ID's for the trace transfers. Supports enable and disable access for clock. Rich set of configuration parameters to control ATB functionality. Notifies the testbench of significant events such as transactions, warnings,timing and protocol violations.